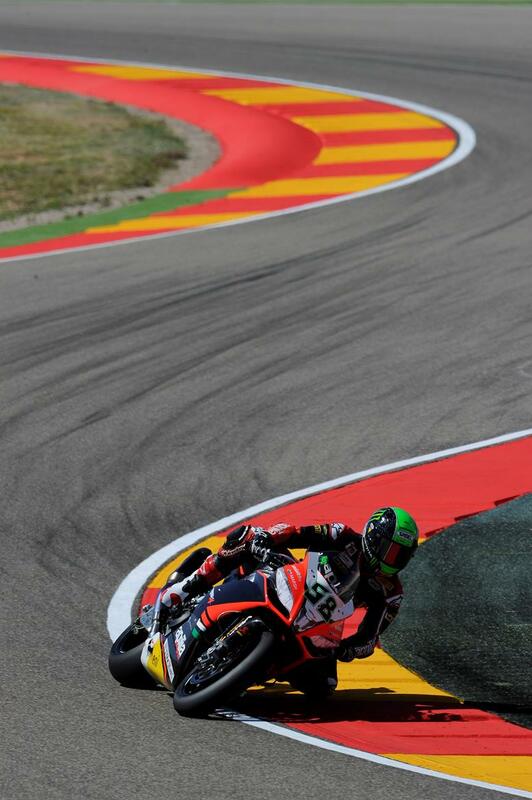 Factory Aprilia man Eugene Laverty stole provisional pole position from his friend and rival Chaz Davies on his final lap of qualifying at Aragon today. The current championship leader posted a 1:58.548 best to move ahead of Davies after overcoming a number of small electronic issues during this morning Free practice session and this afternoons qualifying. Speaking to MCN, he said: “I had to work on the electronics and get it working as I wanted on corner entry which meant we didn’t have that much time to try the other tyres or work so much on the set-up. But saying that we’re pretty close and the times we’re doing are close enough compared to last year’s race pace. Chaz Davies made an impressive start to his race weekend by securing the second fastest time onboard his GoldBet BMW Motorrad S1000RR. Davies secured his first ever WSB podium at the Aragon circuit last season and clearly feels an affinity with the Spanish track. Kawasaki man Tom Sykes ended the day third fastest with Italian Marco Melandri rounding out the provisional front row. Jonathan Rea enjoyed a better day onboard his Pata Honda with his team having improved the electronics package after three days of un-scheduled testing in Spain last week. Fixi Crescent Suzuki rider Leon Camier was credited with seventh place in qualifying, but is unlikely to take any further part in the Aragon meeting after a heavy crash at the beginning of qualifying. The 26 year old suffered a big highside exiting the fast, third gear, turn ten which saw him land heavily on his left knee. While he appears to have escaped broken bones he suffered a severe cut to his knee which was subsequently filled with gravel after he ended up in the gravel trap. Camier was taken to Alcaniz hospital for treatment. Leon Haslam finished the day 11th fastest onboard his Pata Honda, one place ahead of Alstare Ducati rider Carlos Checa.